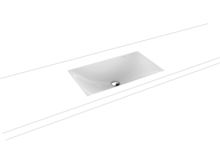 Undercounter washbasins offer advantages that suit particularly a compact bathroom. Mounted under a top, these washbasins are designed to sit flush with the surface, exposing only their interior and blending seamlessly with the top for maximised utility space. An elegant and timeless solution.